Find phlebotomy training classes in North Carolina below! • And must be at least 18 years of age. 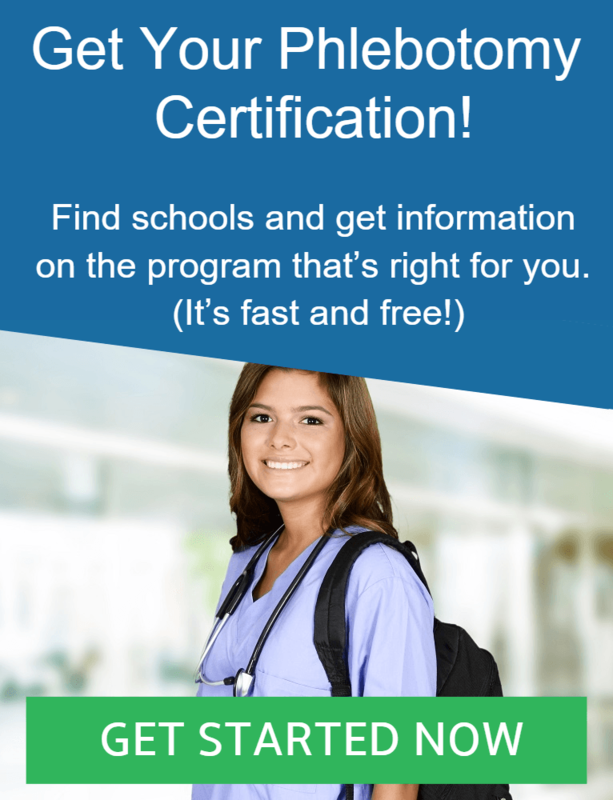 Once all training and classes have been successfully completed, are qualified to become certified phlebotomy technicians by taking the National certification. Further, as a graduate you are qualified for work within doctor’s offices, clinics, hospitals, and other health care settings. The certified phlebotomy training course at CPCC consists of a 7 week classroom study and upon successful completion, a 7 week clinical experience. Once both are completed, students are prepared and eligible to seek national certification. With CPCC, you can complete your phlebotomy training in just one semester while learning from knowledgeable and experienced instructors. You get real, hands-on experience in both the classroom and the lab plus receive on-the-job training during your clinical study. Phlebotomy training classes at CPCC start in the Spring and Fall semesters and are patterned on the requirements set by the American Society of Clinical pathology. The phlebotomy technician course offered by Miller-Motte will help you gain the necessary skills to become a highly skilled and qualified phlebotomist. Course education includes preparation of specimens for lab tests, standard processes for collecting and handling specimens among many others. This training equips you to become a qualified phlebotomist at any entry-level position within the healthcare setting like in medical laboratories, hospitals, doctor’s offices and more. If you are looking for a career in the medical industry and enjoy working with other people, then enrolling in our phlebotomist course is the first step in that direction. A 90-hour phlebotomy course program is being offered by North Carolina AT&T State University. Recently there has been an increasing demand for phlebotomists in retrospect of increasing knowledge on infectious diseases and advancement in health care services. Moreover, as a phlebotomist you have a wide array of job settings to choose from, like insurance carriers, veteran hospitals, public health facilities, HMO’s, medical group practices, neighborhood health centers, hospitals among other medical institutions. Courses offered can vary between 6 to 8 weeks of lessons and training depending on the time slot chosen. As a phlebotomist, you will be tasked to draw blood and other non-blood specimens from the client for analysis in the laboratory. As a student of the phlebotomy program, you will be trained in all aspects in relation to collecting blood samples and other specimen while incorporating the skills you have developed for a safe and correct implementation of venipuncture. • And medical terminology among others. At Cape Fear Community College we offer a Phlebotomy Certification program that primes students to become competent phlebotomists in the field of medicine. The mission of the program is to create students that are capable in drawing blood and obtaining other non-blood specimens from patients for analysis in the laboratory. In line with this mission, it is also the goal of this school to groom their students such that once they graduate from the program they can practice the role of a phlebotomist competently. Student graduates of the phlebotomy program are qualified to work in various health care settings like doctor’s offices, clinics, and hospitals. They are also eligible to take the National certification for Phlebotomy Technicians. CFCC’s phlebotomy program applies selective admission processes. Therefore, a potential student must meet the minimum requirements set by the school before being eligible to enroll in the program.